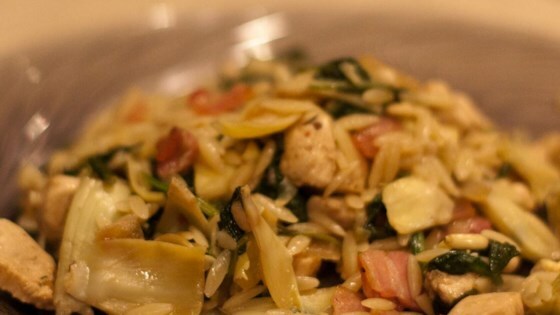 "Orzo with Artichokes, Balsamic vinegar and Chicken -- as easy as A-B-C! Pancetta, spinach, and toasted pine nuts also play tasty parts in this pasta dish! This is a great way to use up leftover roast chicken (or turkey) meat!" Heat 1 tablespoon olive oil in a large skillet over medium heat. Stir in pancetta, and cook until browned. Remove to paper towels. Pour 2 tablespoons olive oil into skillet. Stir in onion, garlic, and red pepper flakes. Cook, stirring occasionally, until the onion is soft and translucent. Increase heat to medium high, pour in white wine; cook about 3 minutes. Reduce heat to low, stir in chicken, artichoke hearts, and spinach. Cover, and cook to warm through. Meanwhile, bring a pot of salted water to boil. Add orzo pasta and cook until al dente, about 8 to 10 minutes. Drain, and stir into chicken mixture. Stir pine nuts and balsamic vinegar into pasta. Pretty good but its missing something, not sure exactly what. I may try it again with tomatoes or something. This was tasty and easy. Way too much orzo though. Cut that in half. This recipe makes more than 4 servings.